Canada Day is coming up on July 1st. The day marks the anniversary of the 1867 enactment of the Constitution Act, which united three separate colonies into a single Dominion within the British Empire called Canada. But I think what people mainly celebrate on July 1st is the fact that it's warm outside (hot even) and we finally get to enjoy our lakes, beaches, parks and swimming pools. And maybe a cold beverage or two. Canadians don't tend to display the national flag on our porches as often as our American neighbours, but our red and white flag does make a strong appearance on Canada Day. 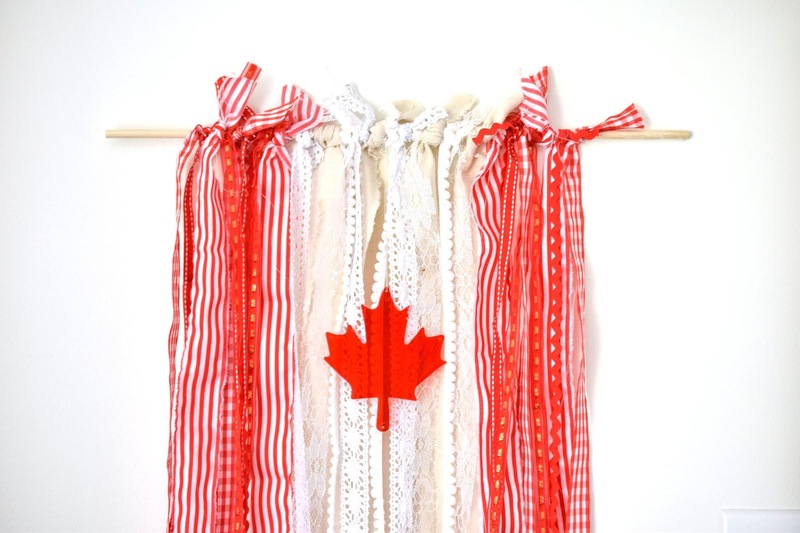 The inspiration for my patriotic Canada Day ribbon flag was in fact a DIY American ribbon flag I saw on Pinterest. 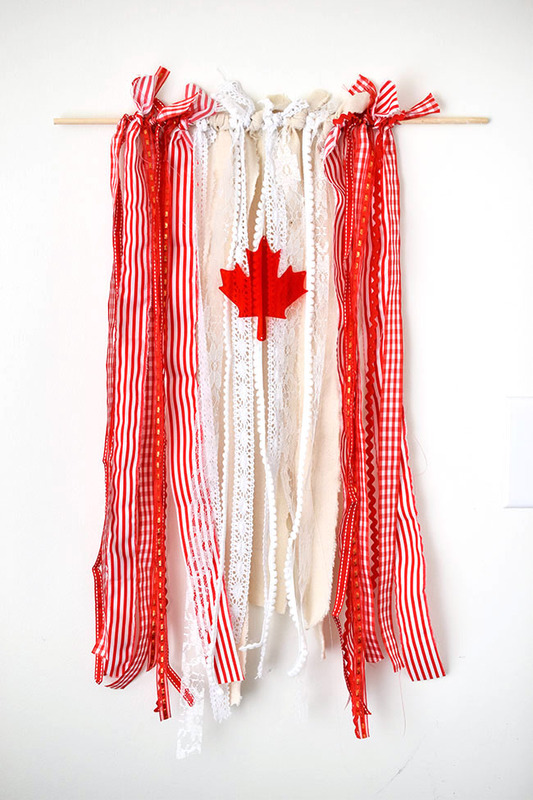 I googled "patriotic Canada ribbon flag" and came up with nothing but a bunch of plastic flags for sale, no DIYs. So I thought I would create a DIY ribbon flag tailored to the celebration of our beautiful country for Canada Day. Anytime we're celebrating a special event, it's nice to get together with friends. Today is no different. 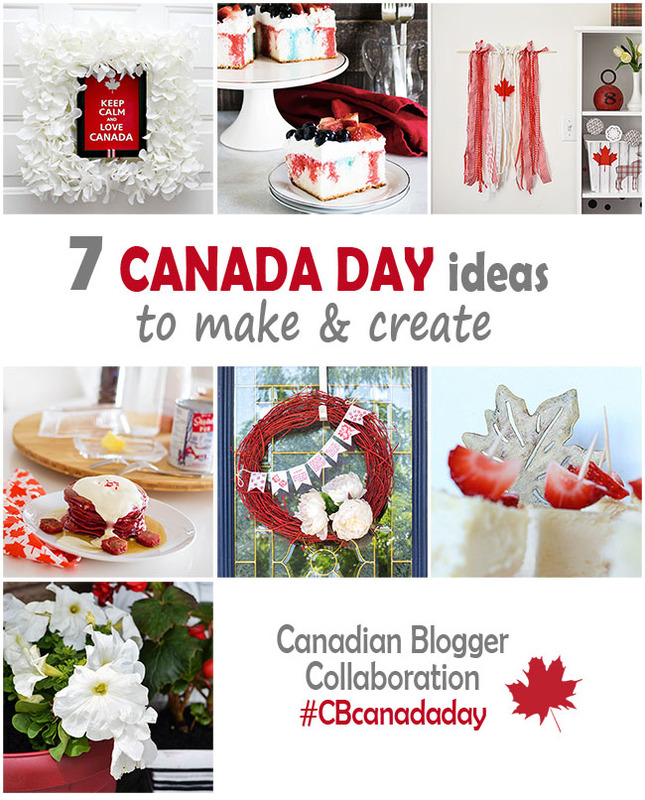 I have six Canadian blogging friends joining me to share their creative ideas for Canada Day food and decor. 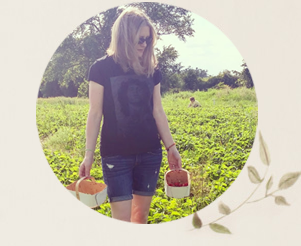 See them via the links at the end of this post. 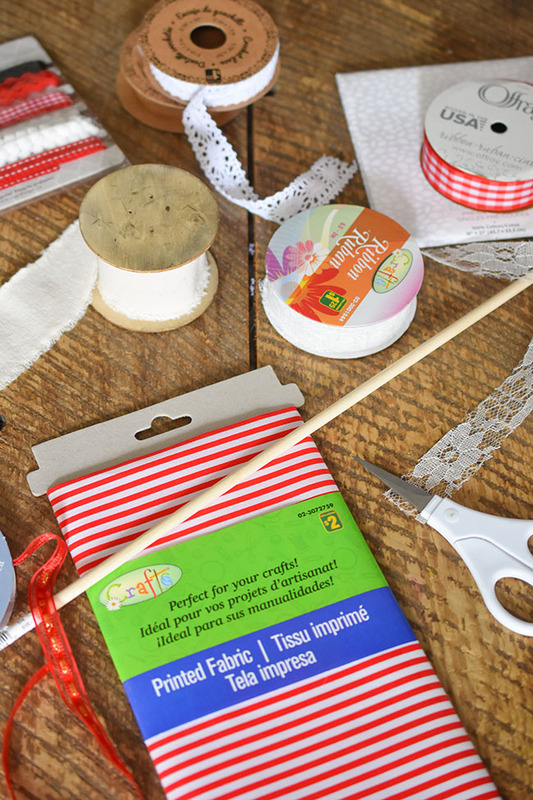 I bought most of the materials needed for the ribbon flag brand new from the store but it would be ideal if you had leftover red and white fabrics and ribbon among your craft supplies. red maple leaf - I used a plastic one taken from a dollar store wind chime kit. You could also cut one from fabric or felt. 1 card with various ribbon/trim on it for $5, 5 different types, 2 metres long each. I also used some natural coloured wider cotton ribbon I already had, in place of a white fabric I purchased at Walmart and plan to return. I used a dowel that we had in the garage. 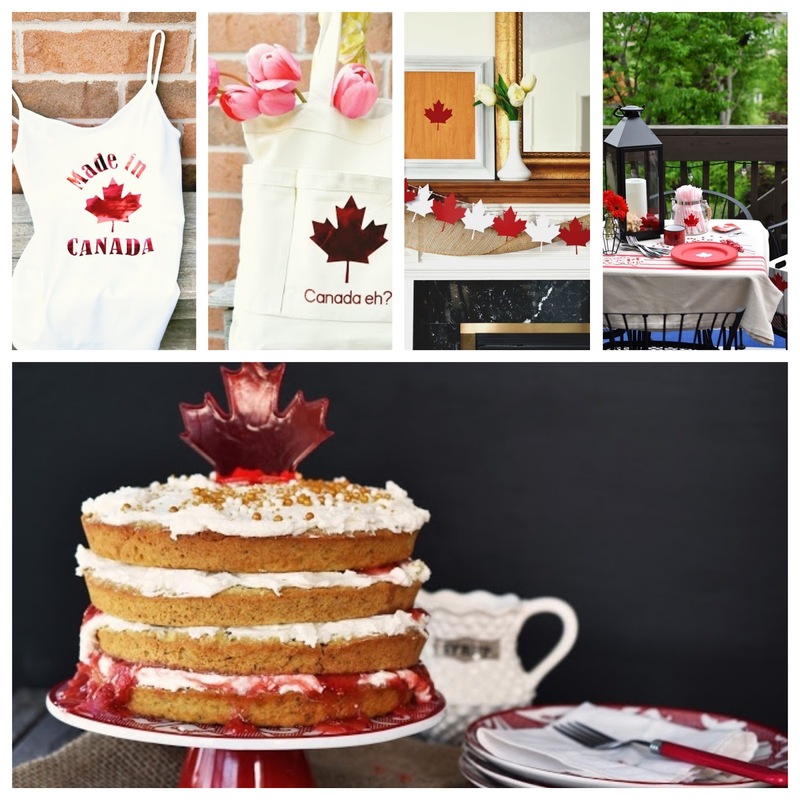 I already had the red plastic maple leaf - I used it previously to top this True North Maple Cake. Just to give you an idea of how much material you need for this project: when my ribbon flag was finished, I had some of the dollar store fabric and a bit of the trim left but all other ribbon was used up. Tie the white and natural ribbon to the centre of the dowel or branch, alternating the types used. Tie the various red ribbon and fabrics to the left and right of the (larger) white area, alternating materials again. Tie the maple leaf to the centre of the dowel using white thread. The plastic maple leaf from the wind chime kit has a hole in the centre so it was easy to attach. I thought about cutting the maple leaf from felt - it would be easy enough to put a hole through the felt too. 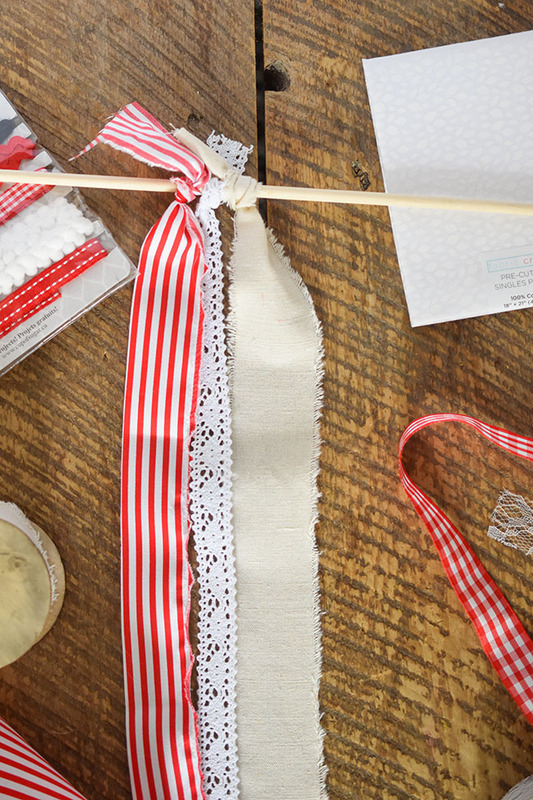 Tie a length of twine or string to the two ends of the dowel (not shown) to hang the ribbon flag from a nail or hook (or maybe outside on a tree branch?) There happened to be two nails holding up a picture in the spot where I wanted to photograph the ribbon flag, so I simply put the dowel over the two nails. Now it's time to mix up a sweet-tasting red cocktail or these family-friendly strawberry no-jitos. Get out and enjoy that sunshine my friends! Because we all know that part of being Canadian is partying hard in the summer to get us through those dark winter months. 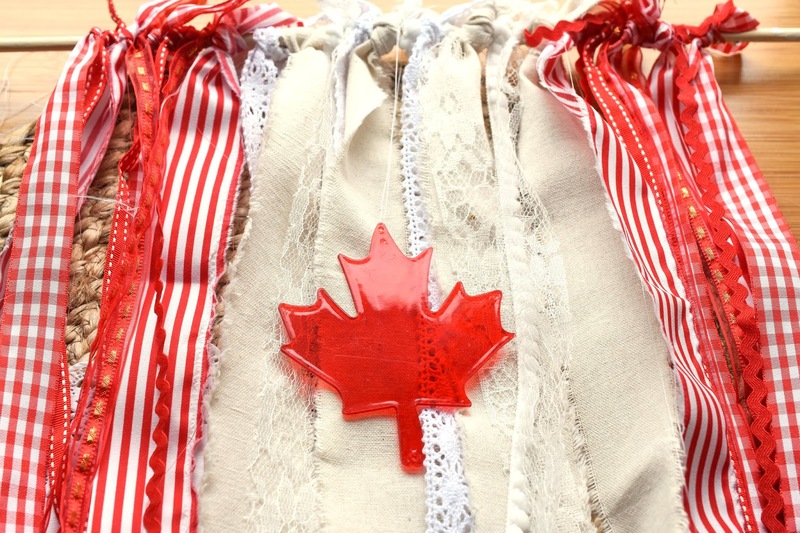 What about you - do you celebrate Canada Day? How so? Do you decorate in red and white, don a Canada-friendly t-shirt or just stock up on beer? Visit my Canadian blogging friends to see some fabulously festive DIY and food ideas for celebrating Canada in style. 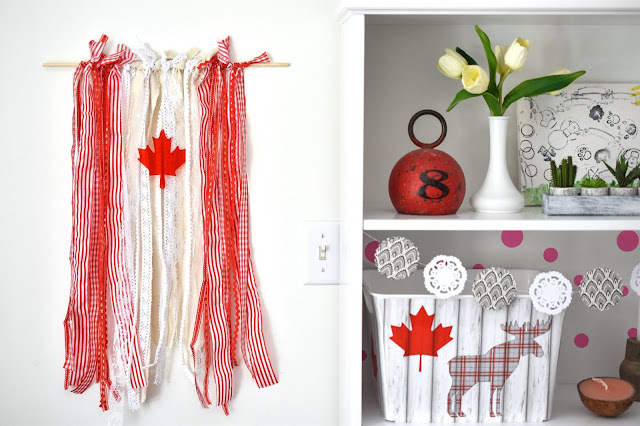 Your ribbon flag does look nice and light, and I like that you can pretty much hang it wherever too (as opposed to a big, normal flag) - so creative! Aw, thanks Sarah! Such a nice compliment. I hope you do get a chance to make one. Happy Canada Day! Joann! I seriously just can't get over how creative you are! This is something I'd definitely love to hang in our new home - especially for upcoming festivities! Love The True North Maple Cake. The ribbon flag is such a unique idea for a decoration!! 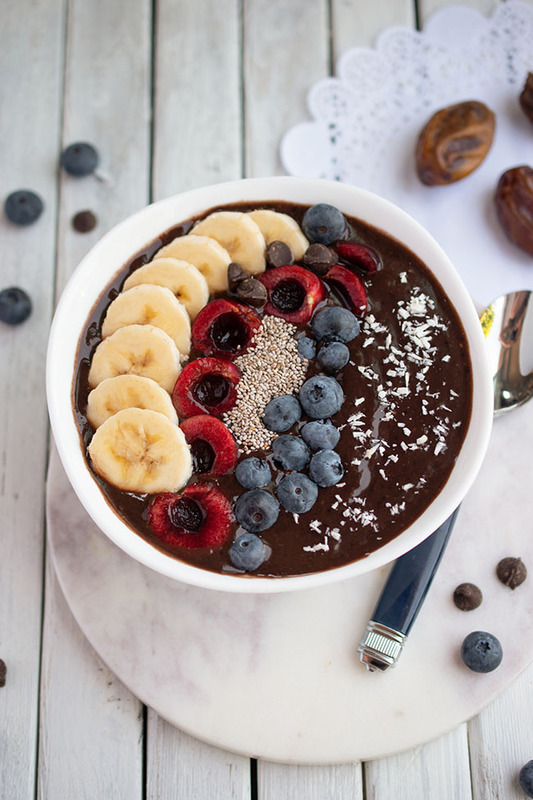 Very innovative and thinking outside the box-love it! 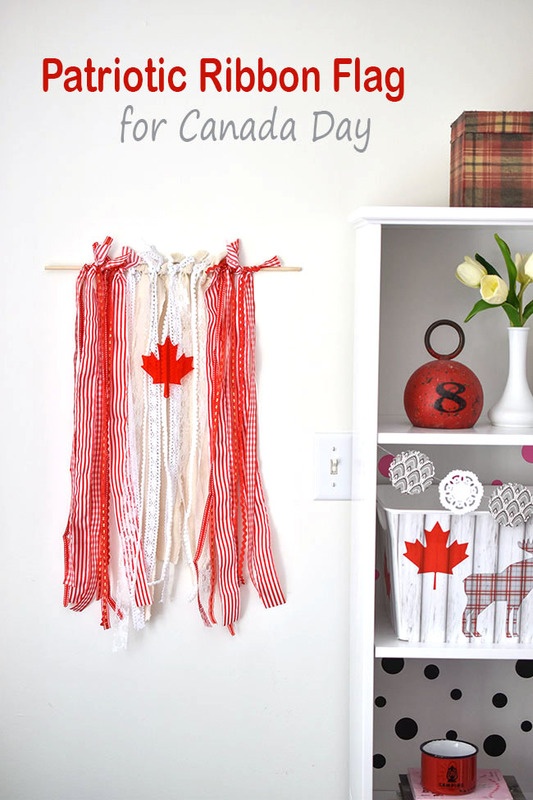 Great Canada Day ideas. I put a flag in our window, but didn't get around to doing anything creative. I don't normally decorate for Canada Day but this year I had wished I'd had a flag. I would totally try this for next year, I love the look and it would be really easy to do! This is different! I might even have the fabric for it! 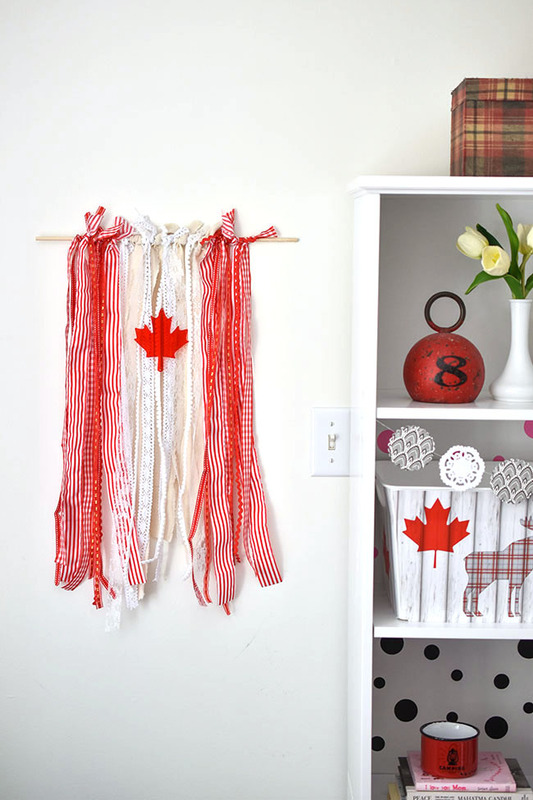 such fun, easy and creative ideas to dress up your space for Canada Day! Clever way to make a flag. Love your unique flag craft & scrumptious looking cake, thx very much for sharing them with us!